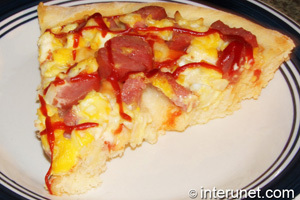 How to bake under 5 dollars homemade pizza? There are lots of healthy foods you can find in any grocery store for any budget. To eat well, you do not need to make these expenses the highest compare to other monthly expenditures. Regardless of how cheap or expensive the dish will be, you will get tired of eating the same course meals eventually. Proper planning, organization, and creativity will make a huge difference on your monthly grocery spending. Many families make Friday night a “pizza night”. Depending on the family size, they order 1 or 2 large pizzas paying about $25 - $30 for each plus a tip. On the other hand, they could potentially make it themselves and have creative and fun time together by personalizing each piece as desired. One thing that usually stop people from doing so is that some of them are not comfortable to deal or cook with yeast. They erroneously think that it is hard. However, to make a pizza dough is not that difficult as it seems. The trick is after you mix well all the ingredients together, place the dough in a warm place and wait until it fully rises. Other thing to consider is to be careful with flour. If you feel like it is necessary to add more of that ingredient than according to the recipe, then do it slowly. Too much flour might make the dough dry and hard. The recipe is for 15.75” (40cm) pizza baking pan and makes servings for about 5 – 6 people. The dough should be pretty thick approximately 1.5 – 2 cm and relatively not big piece can satisfy your hunger. Calculation of how much you spent on a pizza if you would prepare it yourself. 2 tablespoons of butter (1/4 of stick – 1 package of butter which includes 4 sticks cost about $4. One stick contains 8 tablespoons. If one stick equals to $1 and you need ¼ or 25% of that, it will cost $0.25. 1 egg- 1 package includes 12 eggs and cost about $2 or $0.17 per egg. ½ tablespoon of salt -1 package (26 oz.) of salt contains 52 tablespoons and cost about $0.50. Salt will cost you half a cent or so. ½ teaspoon of sugar– it costs you less than one cent. Cost of pizza topping will vary greatly depending on what you want to put on top of it. Usually people use leftovers that they have in the refrigerator like meatballs or other cooked meat which makes it cheap as well. 2 table spoon of barbecue sauce – one 18 oz. bottle of sauce cost about $1.50 and contains 36 tablespoons. You will pay for 2 tbsp. $0.08. 1 smoked sausage, sliced – one package of 14 oz. (397g.) sausage worth $4 and has two sausages. So, your cost will be $2. 1 large onion, chopped – depending on weight, one onion will cost about $0.10 - $0.20. 1 tablespoon of mayonnaise – one 30 oz. jar of mayonnaise costs $4 and includes 60 tbsp. Your expense will be $0.07. 1 package of grated cheese (optional) – one package of cheese cost $1.50. You can put the whole package or half of it depending on your taste and preferences. Some people do not put cheese at all because mayonnaise will preserve the onion and egg moist and juiciness. Note: all the ingredient prices may vary depending on region, stores, quantity of buying products, seasons, or brand names you prefer. If we total up expenditures on all ingredients for the pizza dough, it will equal to $1.69. The total cost of the topping from the example above yield to $2.48. Actual expenses of pizza topping will constantly vary because you will bake each time different kinds of pizzas, depending on what you have in your fridge or your kids’ choices. However, the overall spending on your huge homemade pizza might not go over $5 anyway. In the example, the total pizza expense is $4.17 or $0.70 per serving. If we compare $5 cost to $30, you can see that there is potential real saving of $25 a week for families who like Friday pizza nights. Furthermore, they will save $100 a month and $1,200 or more for a year. When it is obvious that to bake a pizza at home is very cost beneficial to you. Let’s prove that it is easy as well. 1. Combine sugar and yeast and put it into a glass than pour there about 2 tablespoons of slightly warm water and mix everything well together. Set aside to rise for about 3 - 5 minutes. 2. Meanwhile combine in a large mixing bowl an egg with salt and start adding gradually butter then oil. By the time you will be through with it, your yeast should rise already. Pour the yeast, then milk and mix all the ingredients well. After that, begin slowly blending into the mixture sifted flour. 3. Combining ingredients should take you about 10 minutes, so for other 50 minutes let the dough rise. While it is rising, you do not need to monitor its process. Just do other things what you need or have to. 4. Then on a floured surface dump the dough from the mixing bowl and spread it a little bit with a rolling pin. Grease slightly a pizza baking sheet and transfer there the pizza dough. Finish spreading until the sheet is entirely covered. Let it rise while you are preparing some topping. There is no standards for topping ingredients; put whatever you have in the fridge or what your kids like on their pizza. 5. Preheat the oven to 375 degree Fahrenheit, put the topping onto the pizza dough, and bake it for 30 minutes or until is ready. Let the pizza to cool for few minutes before serving. I really appreciate this post. I’ve been trying everywhere for this! impart goodness I found it on this diary . i actually admire your work and that i hope in future i'll come back for additional data. like this one.You have created my day! Thanks again! I actually have some sensible work expertise with custom essay writing services ( https://www.buybestessaysonline.com ) and my words ar clearly supported what I felt through such processes within the past.